Johanna Mountfort has been coaching bodybuilding clients for competitions since 2009 and has many clients who have achieved Regional and National titles themselves. 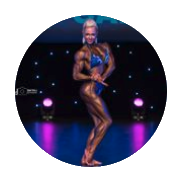 Have a browse through her client bodybuilding gallery! Johanna Mountfort is highly qualified and experienced personal centre coach. She is friendly and motivated and cares about you and your results. She is here to listen, plan and guarantee you incredible personal gains. Preparing for a bodybuilding competition is extremely physically challenging but the biggest challenge for many competitors is the mental strength needed. Training whilst dieting, pushing reps through the fatigue/failure threshold and overcoming nerves requires confident coaching from an experienced and seasoned professional coach who can guide you through every phase, help you overcome physical and mental obstacles and prepare you to present your very best on stage. This is Johanna’s forte and is the reason why her clients are so successful also.